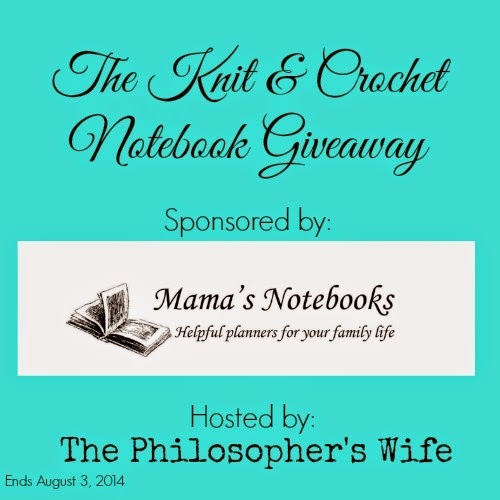 I am excited to bring you another giveaway from Mama's Notebooks! I still use mine regularly and find it quite helpful. 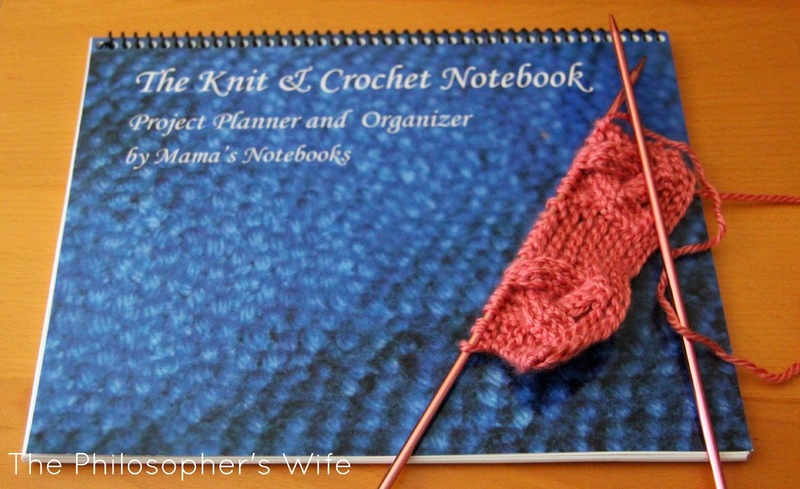 (Here is my original review of The Knit & Crochet Notebook.) This notebook is especially great if you like to customize your patterns. I always end up tweaking patterns! However, even if you always follow a pattern exactly this is still a handy tool. If you're like me, you probably save patterns on Ravelry, Pinterest, Kollabora, and other sites, AND have various books and papers laying about, but with this Notebook you can save everything, including your notes and tweaks, in one convenient spot. Below you can see one of my pages. 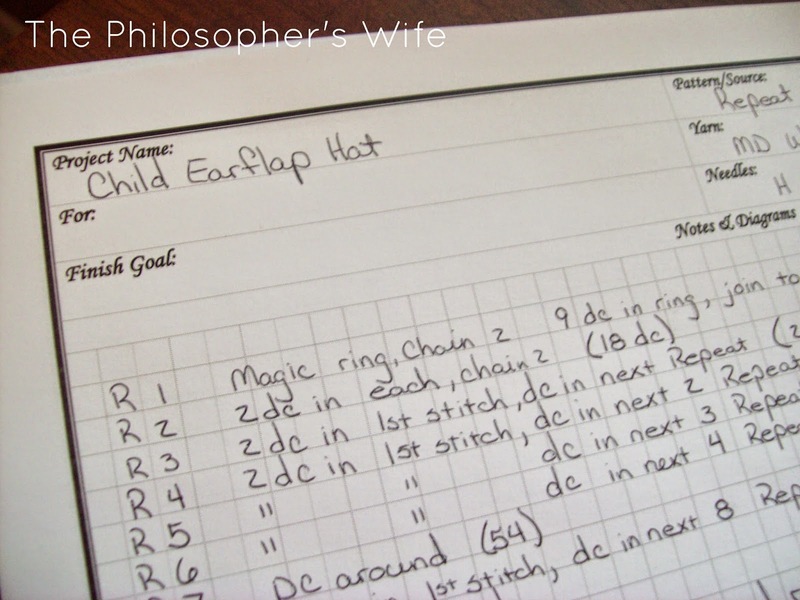 This crochet hat pattern is one that I come back to again and again. (I used it for The Orange Hat, The Cream & Purple Hat, and various others.) As you can see, the project page is graph paper, which is super helpful for more detailed projects. The Knit & Crochet Notebook. Details and Fine Print: Enter this giveaway by using the Rafflecopter below. Open to US only. Must be 18+. Void where prohibited. Facebook and other social media are not affiliated with this giveaway. The Philosopher's Wife is not responsible for prize shipment or fulfillment. I never knew such a notebook was available but I'm forever tweaking and/or creating patterns so this would be awesome!!! I often follow but as I'm getting more and more comfortable with different knitting techniques I am starting to customize a little here and there! This is a fun giveaway, I've been eyeing her notebooks for a while now! I follow knitting patterns because I'm still learning, but I've been crocheting a lot longer so feel comfortable tweaking as I go. I will follow a pattern but if I find a way to customize it, I will. I like to add my own special touch to it. Thanks for the chance to win! I could sure use a notebook like this. Most of the time I make some changes to patterns. What a great idea. I would LOVE this. I didn't know these notebooks existed. Thank you! I'll follow the pattern the first time (unless I see obvious mistakes ;) ) and then tweak the next time around. I don't usually follow a pattern unless it is a video tutorial. I usually stick to pattern, but occasionally add in my own touches. When I find a pattern I like, I tend to use it many times. 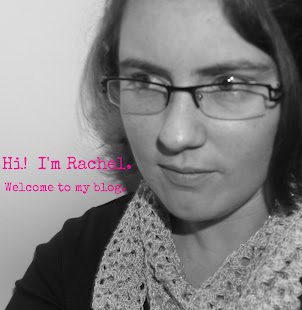 As I go along, I find myself making changes that go along with the way I crochet. I also tend to lose patterns that I liked at one time. This would help to keep track of the favorites in a better way. It depends. Someone I follow exactly and other times I change it. I also make up my own amigurumi patterns so it would be great to have all my notes in one place! I rarely follow directions - unless it's a rather complex pattern.